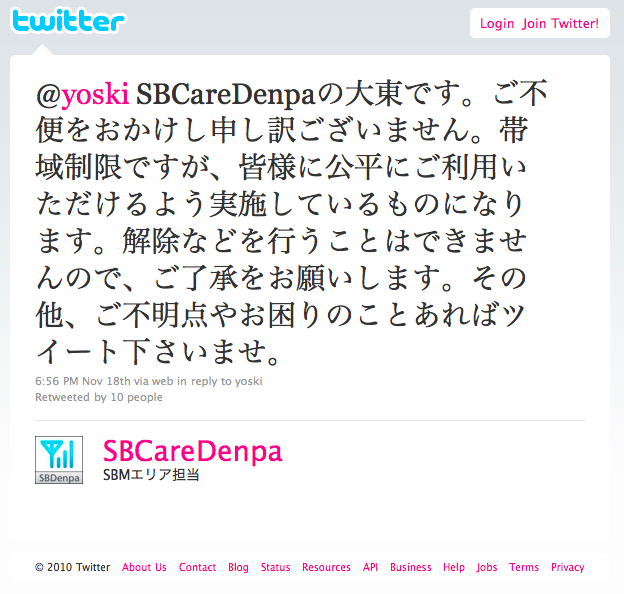 For obvious reasons, I've recently been thinking about softbank allowing skype on the iPhone while Docomo prohibits it. While searching for instances of recent softbank issues with tethering or skype, I ran into a post indicating that softbank is limiting uplink speed in the Tokyo area to around 64 kbps in an attempt to more fairly distribute bandwidth. Well, I guess Tokyo iPhone users won't be using skype over 3G for a while. 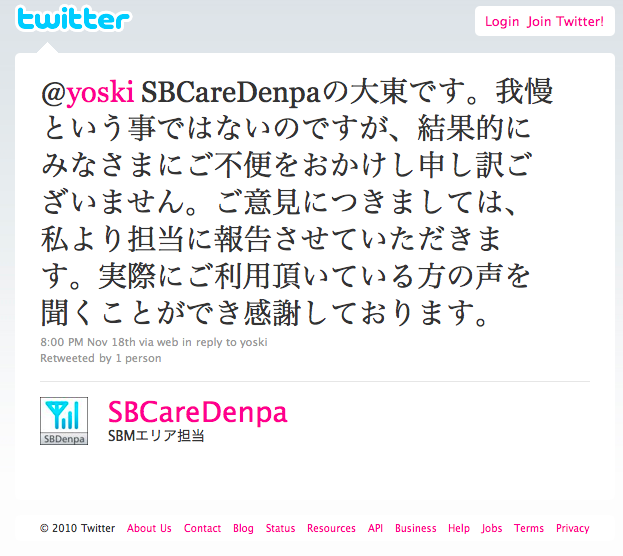 Check it out on Yoski's site (Japanese). There are a lot of responses from around not just Tokyo but the general Kanto region reporting very very slow uplink speeds. 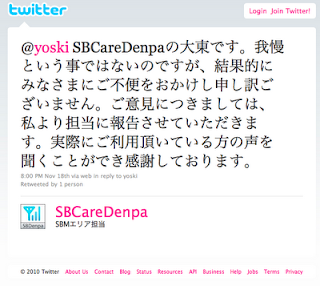 @yoski SBCareDenpa's Mr(s) Daito/Ohigashi here. Deepest apologies for the inconvenience. Bandwidth restrictions are in effect to ensure fair usage for everyone. Please understand that we are unable to remove the restrictions. Please tweet any additional questions or concerns. Hahaha, I'm fine - yo, check it out, getting... 54 kpbs?! wtf?! 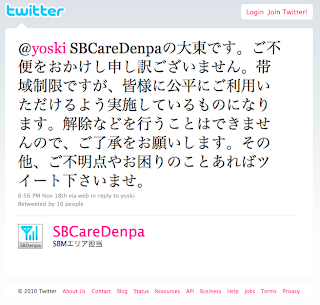 Yoski responds to @SBCareDenpa saying that everyone around him in Tokyo is also getting no more than 64 kbps, wonders if there is a regional restriction, and announces, somewhat sarcastically, that they will... um, how's the best way to say this in English... happily endure/persevere/"gaman", in all fairness, a 64 kbps uplink. While you don't need to endure/persevere/"gaman," we apologize for the resulting inconvenience to everyone. I'll pass your opinion to the supervisor. Thank you very much for allowing me the opportunity to hear the opinion of someone actually using the service. I'm sure that everyone reading this has "endured" a lame response from some random customer service representative. While Mr. Son wants his employees to use twitter, I don't think he wants those lame responses archived on the internet. Yoski concludes that softbank, in fairness to all customers, is throttling the uplink of just everyone in Tokyo and notes that the 3G highspeed network is advertised as having 3.6/7.2 down and 1.4 Mbps up, though the iPhone 4 is not listed as compatible. Since there are people also reporting higher uplink speeds, I wonder if this isn't just normal network congestion, though. In case the links to the tweets die, here are screenshots. Thats just crazy! do they want more people to use Docomo? The Galaxy S easily beats the iPhone4. I was using my wifes iPad at a friends house and got fed up with the speed so I wirelessly tethered it to my Android phone on Docomo problem solved! I havn't been using skype on Docomo since the app is pretty much worthless on Android right now. Also since Google Talk calling to the US is free right now I have been using that to call home. Google talk is also prohibited. All voip clients are. Google Talk and skype are listed by name. It is also a possibility that Docomo is just being more strict. FYI I am also getting 58-68kb/sec according to the speedtest.net app on my grey SB simcard (on an android phone), so I don't think its limited to just iPhones. I work in Kumagaya (North Saitama) during the weekdays, I'll have to see if Softbank's grip extends that far north Monday. What would it take to get around attempts at blocking VOIP, tethering, and presumably bittorrent? A VPN to a home or other server? And since the bootloader remains uncracked on the Xperia X10, is there any way for me to do wireless tethering anyway? I think the Galaxy S, with android 2.2, has had the wireless tethering functionality stripped out of it. A docomo guy at the Yokohama Station Yodobashi said as much to me, and in looking at its settings, I couldn't find tethering anywhere. Which are primarily used for p2p and stuff related to voip. Thanks for the links. What I've done is to install and run z4root and now Barnacle WiFi Tether. For the rest of this month (or my billing period...), I'll use html/web browsers, Thunderbird email, youtube, but no skype. I'm not doing anything with a VPN yet. I think my home router (Planex/PCI MZK-W04NU) could do it. If the tethering itself is no problem, then I'll start playing with ports and tunnels to keep private my data stream from docomo's inspection. Any other suggestions for what to avoid or to try during this billing period? I'll post results here when I know. I checked yesterday when I was in Ueno and I got 287 down, 62 up. Today, in Hadano, I checked again and I got 858 down, 385 up. Black uSIM in an unbranded HTC Desire. I recall checking speeds in a Hadano Softbank store a few nights prior and registered about 2000 down, 400 up on one of their Desire HD's (presumably running on a silver uSIM). When I go back, I will check again. Nick, have you worked out some way to get Google Talk to work from your phone? I've got mine all set up, but the app wants to dial a number in the U.S. I suppose it's more likely that you're using a headset with a PC to make the calls. Let us know, though, because it would be awsome to get that working from the cell. I use SIPDroid on the cell, but Softbank's bandwidth limitations are making that really hard to use with 3G of late. I was wondering what was up with my bandwidth lately. Podcasts don't want to come down over 3g anymore. They keep timing out. SpeedTest confirms, downlink 72k (!!!!) uplink 56k and ping 999 (!@#$*%&@#*). Maybe it's time to get a Galaxy S. I've had my eye on that beast for a while now, but I wanted to hold out for an LTE phone (until I learned of the content restrictions and bandwidth caps!!?!). Ahh well. I guess the phone companies are going to do their level best to price the innovation that Android brings to telephony out of range of us normal people. 60 to 90 is not reasonable. We're paying for 1.4mb up, 3.7mb down, and getting less than 10% of that. If this were the states I'd be calling a class action lawyer now. This is likely a result of Softbank's reckless race for market share. They're probably representing a very sizeable majority of smartphone users thanks in no small part to their smartphone selection (which as always been relatively strong, but even more so considering their Winter-Spring lineup), but at the same time they have been keeping very competitive plan prices. They probably can't possibly hope to expand their network to meet its new demands, so I bet their strategy involves throttling each and every user into as few mhz of spectrum as possible until they all fit. The timing doesn't come as a surprise either. What's happening next month? They unleash their newest smartphones. I'd say they are adjusting their policies in anticipation of a spike in network load beforehand, rather than piss off all those users who will be swapping their galapagos keitai for smartphones down the road by throttling them when it actually does become a problem. You can't complain about the speed if you don't know what fast is!